For most of this summer I have been training on my own, so it was high time to visit my coach Petr in Orillia. A week and a half ago, we put together a nice three days of training. We managed to fit in two sessions of mountain biking, a plyometrics workout, a rollerski session, a run, ski striding up a ski hill, and a workout at the gym. The mountain biking took us to Hardwood Hills. I have heard much about the mountain biking here, and I have to say that the trails definitely lived up to my expectations. I had only been to Hardwood once before for a ski race this winter, so I was excited to explore more of the trails. I had considered entering my first mountain bike race during the Wednesday night series of races at Hardwood but in the end I decided not to race. Since I’ve only been mountain biking for three months, I’m not able to push myself to a full race pace because my technical abilities lag behind my aerobic capacity. I was upset not to race, but pushing beyond my limits and getting injured in a bike crash is not a good option for me right now! 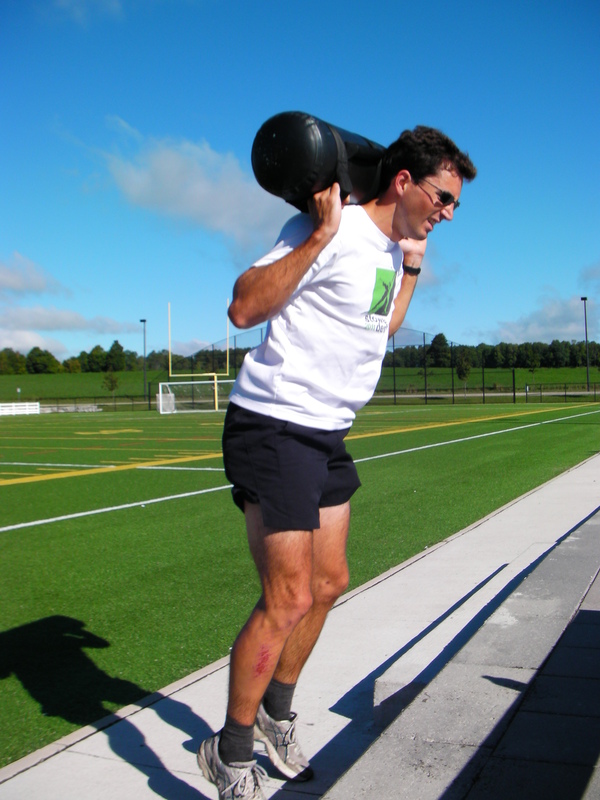 We added some weight – in the form of an Aquaroll to the plyometric workout. I was thoroughly impressed with the rollerskiing around Orillia – smooth pavement, little traffic and steady hills made for a very pleasant and safe experience. In we worked on maintaining good technique during maximal effort , mostly for offset skating, and a little bit of work on double poling as well. Petr took some videos which I always find excellent for really understanding what I need to work on. The hardest workout of the three days – and quite possibly of my entire ski career took us to Mt. St. Louis. This local ski hill provided us with a “nice” slope which rose 120m over 500m. The goal was to ski walk up this hill six times, while maintaining good technique (arm extension behind the hip, full leg extension, powerful steps, head and eyes looking up.) Each trip took me just over 5 minutes, and I’ve never been so tired while “just” walking. I found the three days very productive and look forward to more – this coming week Petr and I will be returning to Gatineau to repeat some strength endurance tests which I first did in late April to see how the summer training has gone – wish me luck! Working hard on interval 5 or 6. Technique breaks down and the legs and lungs scream!